human behavior is so fickle. Schizophrenia is a severe form of fickle human behavior. Human fickle behavior is human behavior which is inconsistent, capricious, vacillating, unpredictable, erratic, and changeable. Perhaps, all these one word descriptions of fickle human behavior can be related to schizophrenia, or, at least behaviors which are forerunners to that severe form of human mental contradictory behavior. the "fickleness of human nature." 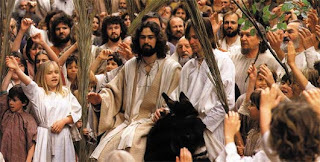 This Sunday again, marks the Christian world’s beginning of “Holy Week.” That particular day which initiated Christ’s last week on earth before His resurrection from the dead, is usually referenced, as “Palm Sunday.” Jesus entered Jerusalem to be met with hordes of crowds, singing his praises. [Matthew 21:1-9] However, 5 days later on [Good] Friday the crowds of people were demanding Pontius Pilate for Christ to be crucified. What can explain this radical change of behavior of that crowd who called for Christ’s crucifixion? On the surface, we can point to massive schizophrenia. Human fickle behavior was rampant. Within 5 days of singing Christ’s praise, they were damning Christ, viciously calling for His death. Truly, it was inconsistent, capricious, vacillating, unpredictable, erratic, and changeable human behavior at work! of hell for a number of reasons. Before you non Christians think that you are in the “same boat” as Christians, you are sorely mistaken. Your sinful nature is utter and nasty to the core, with nothing to check it or keep it in place. Your very nature is so fickle that you could go psycho at any time. You do not have the spirit of Christ. You do not have the Christian’s new nature that would compel you to seek after the spiritual things of the Triune God. Baring repentance and faith in Christ, you will spend an eternity in hell, when you die. You have nothing to look forward to, except fleeting time in this world. You will only look as far as the next meal; the next drink; the next drug; the next entertainment; the next human encounter. And, at anytime, you could die of natural causes; a brutal instant accident or a swift growing disease. What will you do? How will you make future plans for your priceless soul? Can you force yourself to be God’s friend to escape His disfavor because of your sins against His holy commandments? Does it really bother you that your time in this life is so severely limited? Or, do you talk foolishness to yourself and say that the only life you’ll ever live, is, in the present? May the Triune God have mercy on your soul – you who are not God’s children by faith in Christ Jesus! As I’ve stated sometime before, I have no 4 or 5 point prescription plan for you to come into God’s good graces, and for you to come away with a clean conscience. Saying a prayer and then having someone tell you, that because of your prayer, you are then a Christian and are going to heaven, is utter nonsense. You can’t work or earn your way into God’s good graces and into his holy heaven. You must have put on the righteous (holy) clothes of Christ’s holiness for God to accept you. [Matthew 22:2-14 ; Philippians 3:8;9] Christ died for all your sins – past, present and future. But, that does not make you into being one of God’s dear children, anymore than the presence of a cookie jar possessing cookies within its container. Please note: "God is not your heavenly father unless you are one of His children"
Friend, you need to avail yourself of the Scriptures. Faith comes by way of God’s Word [the Bible – Romans 10:17] You shut yourself off from God’s Good News Message for you, and you consequently cut yourself off from God, His forgiveness and His holy heaven. Don’t delay in becoming serious about your priceless soul! May the good and gracious God, have mercy upon your soul and may He remove those mental obstacles that you put in the way of your priceless soul.